Ashok Leyland UAE has begun work on an expansion of its Ras Al Khaimah factory in the UAE which will see production nearly double and put it in a stronger position to feed markets locally and the remainder of the GCC region. Further expansions are likely as the company, a joint venture between India’s Ashok Leyland, part of the Hinduja Group, and the Ras Al Khaimah Investment Authority (Rakia), plans to broaden its geographic footprint with sales to the African continent. The RAK plant’s current output is 12 buses a day and the new investments will enhance this to 20 buses including new models plus trucks. The truck figure was not disclosed. The cost of the expansion was put at $10 million. The expansion project includes the setting up of a design and service training centre, marking an enhanced commitment of the flagship brand of the Hinduja Group to the UAE and the GCC region. Ashok Leyland is the second largest commercial vehicle manufacturer in India and the fourth largest bus manufacturer in the world. HH Sheikh Saud Bin Saqr Al Qasimi, Supreme Council Member and Ruler of Ras Al Khaimah, laid the foundation stone for the expansion project. Present were Sheikh Nahayan Mabarak Al Nahayan, Minister of Culture and Knowledge Development, and G P Hinduja, Dheeraj G Hinduja and other dignitaries from the Hinduja family along with the senior management of Ashok Leyland including Vinod K Dasari, managing director. 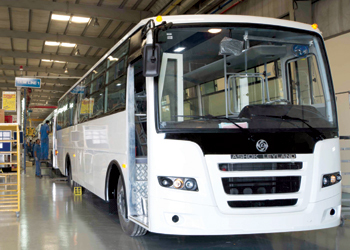 “This plant is key for the supply of buses to address the needs of GCC countries, and with Ashok Leyland’s ambitious plans for Africa, we foresee further expansion of the facility,” said Dasari. Ashok Leyland said the RAK plant will be made into a centre of excellence for its overseas expansion and the new design and service training centre was a move in that direction. The company also highlighted it has successfully created a vendor hub in Ras Al Khaimah and the nearby emirates. “We are aiming to grow significant localisation levels soon and towards this we are working very closely with Rakia on creating an automotive cluster in Ras Al Khaimah where our vendors will set up shops,” Dasari remarked. “We will be foraying into the value-premium segment of the automotive market of the UAE and the GCC region this year as part of enhancing our product portfolio. This would be in addition to our predominant presence in the school bus segment of the UAE with a market share of over 70 per cent owing to our robust design and enhanced safety features,” he added.